Han Solo is my favorite character ever. In anything. I’m guessing, I’m not the only person who feels that way. He’s simply a badass with a swagger that’s second to none. For some reason, though, I personally have a weird fetish when it comes to Solo. I only love him when he’s cold. What the hell does that mean? Well, I’m a big time collector. I collect lots of crap, but when it comes to Han Solo, I almost exclusively collect him in two forms: in his Hoth outfit and frozen in Carbonite. Both instances, both originally from The Empire Strikes Back, both Solo being cold. Is this because I just want to give him a big hug? Is it because I think he’s “cool”? Maybe, but I think it runs a bit deeper. I think it has to do with action figures. Let’s start with Hoth Han. Solo is seen in this outfit for only a few scenes. He’s out on the Tauntaun with Luke, walks around the base, destroys the Imperial probe droid, and saves Luke by shoving him into a Tauntaun. It’s probably all of 10 minutes of screen time and yet I’m obsessed with it. I have a memory of playing Star Wars in the snow with a friend of mine. We were sitting down, pretending it was Hoth and I, of course, had a Hoth Han figure. I think he blew up or something, we threw him across the yard and I never found him. I lost my favorite toy and now, I compensate by stuff like this. My Hoth Han collection, featuring pieces from Sideshow Collectibles, Funko, Mezco, Lego, Master Replicas, Kenner and Gentle Giant. An original painting by Scott C and Disney Vinylmation. 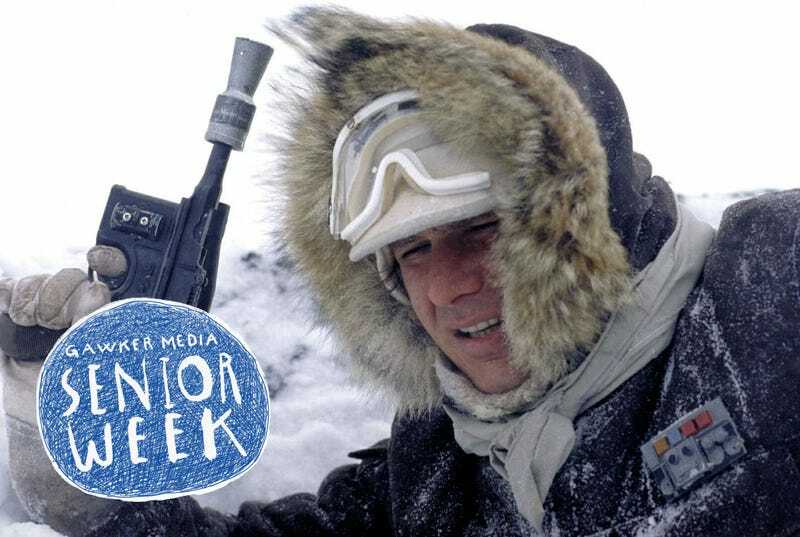 And to get really, really nerdy, yes I know that the jacket Harrison Ford wore on set was actually brown. But, because of the lighting, it looks blue in the movie and all the early toys were blue, hence the long debate. I stand firmly on team blue because I owe this obsession to Kenner. As we all know, Darth Vader freezes Han in Carbonite to make sure the system will work for Luke Skywalker. It does and Boba Fett takes Han’s frozen form to Jabba’s Palace on Tatooine. First of all, the design of Han in Carbonite is simply the coolest thing ever. The lines, folds, the expression of Harrison Ford’s face, it’s just so striking. Plus it’s made to be a display piece. That’s how Jabba uses it in the film so it would make sense that I collect it. For the explanation, though, we go back to the action figures. As a kid, I had the Han in Carbonite Power of the Force figure from Kenner and played with it often. At some point, again, I lost Han. I had the outer Carbonite piece, but not the Han figure inside of it. Which basically crushed my soul as a six-year-old boy. What did I do? I took the remaining piece, the Carbonite, and displayed it in my room. Which now, leads to this. My Carbonite collection, including work from Sideshow, Disney, Lego, Hero Complex and an art piece by Florey. Also, you’ll notice I have a crayon carved into Carbonite, but not my original toy. That’s a lot of Han in Carbonite, right? It is. But that’s not even the coup de grace. That’s this. Now I own other Han Solo stuff too. Posters, toys, collectibles and more. I even met Harrison Ford himself last year and the photo is a prized possession. But, because of minor childhood traumas, cold Han Solo will always be my man.